So you have searched the immigration records prior to 1865, and still no trace of your ancestor? If you didn’t find your ancestor’s arrival before 1865, Library and Archives Canada (LAC) has other genealogical resources that can assist in confirming an ancestor’s arrival in Canada. Where did he or she settle? Is he or she listed in census returns? LAC’s collection of census databases, which can be searched by a person’s name, can confirm an individual’s presence as early as 1825. Perhaps a reference exists for one of the parents (recorded as the head of the family) or for a sibling. Many early settlers submitted petitions to obtain land where they could establish their family in Upper Canada or Lower Canada. LAC’s databases provide references to land transactions that give the person’s name, the date of the application and the county or township within a province. Perhaps he served in the military? Muster rolls, pay lists and various registers can reveal useful information when tracing former military personnel. Have a look at the Military page where many finding aids are searchable by name. 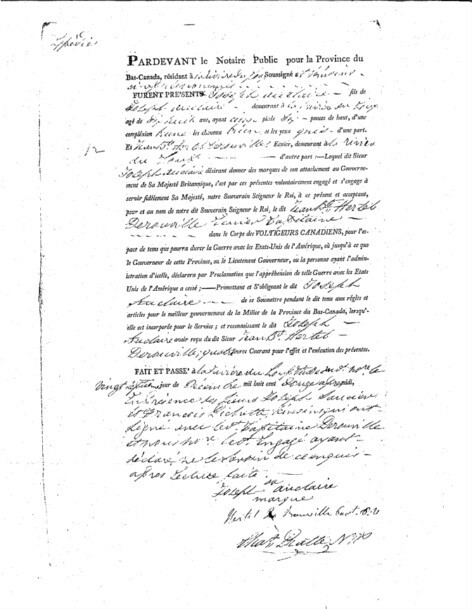 For example, the RG8, C Series (British Military and Navy Records) includes records about Loyalist regiments, the War of 1812, and the Canadian militia. The documents for the RG8, C Series have been digitized and are searchable by name on our website. Refer to the Help pages for explanations of the records. The date of arrival in Canada can be estimated by searching birth, marriage, and death records for first occurrences such as the birth of a child to confirm the presence of the family in a location. Consult our previous blog on how to search for Birth, Marriage and Death Records. Family histories, historical atlases and other published works can be searched in AMICUS, LAC’s online catalogue. It is also possible that your ancestor lived in a location that published a city directory. Many genealogical societies have resources specific to where your ancestor settled. Finding aids that describe a location are valuable tools when searching for ancestors. Immigration and Citizenship records at LAC: Did your ancestor arrive in Canada before 1865? This article, the first of a series depicting Immigration and Citizenship sources, offers insight into pre-Confederation arrivals in Canada. Very few records compiled before 1865 still exist. Most surviving records, which are from various sources, have been indexed by name in databases. The Immigrants to Canada database was compiled from documents such as immigration and land records and some private fonds, namely the Peter Robinson Papers. It provides access to more than 28,000 references to records held at Library and Archives Canada (LAC). The Montreal Emigrant Society Passage Book (1832) database provides access to 1,945 references and digitized documents to people who received assistance from the Montreal Emigrant Society in 1832. The Immigrants at Grosse-Île (1832-1937) database is the result of an agreement between Parks Canada and LAC. It contains more than 33,000 records spanning a 100-year time period. The references describe various events for immigrants arriving at the city of Québec and their time spent at the Grosse-Île Quarantine Station. The Upper Canada and Canada West Naturalization Records (1828-1850) database gives references to the names of 2,967 persons naturalized in what is now the province of Ontario between 1828 and 1850. The 188 registers have been scanned and digitized images are accessible in this database. The Citizenship Registration Records for the Montreal Circuit Court (1851-1945) database provides access to more than 8,000 references to the Citizenship Registration Records for the Montreal Circuit Court. The records have been digitized and linked to the database references. If you think some of your “ancêtres” can be traced back to France, LAC holds a small number of lists from the French Regime (1717-1786). *Note: Don’t forget that the Search Help page of a database is the best place to find out how the records are arranged. Did your ancestors come from Scotland? Do you ever wonder who your first Scottish ancestor was and when he or she left Scotland and arrived in Canada? Are you curious about your family’s Scottish heritage? If so, our website is a great place to begin your research. For instance, you will find a page specific to genealogical research about Scots. It provides you with historical background information, archival and published material from our collection, as well as links to other websites and institutions.